Let us look Kuttanad backwater tours a bit closer. For most people, the best place to start such cruise is Alappuzha town. Kuttanad being a wide zone, the distance to Alappuzha town varies. Since Kuttanad starts just a few kms after the periphery of the town, a boat ride to there is an easy choice. Pick a boat that suits your plans. If you travel in a group or join forces with somebody, then a large house boat could be the choice. A house boat is a monster wooden boat with a few rooms, toilet and kitchen. They come with a skipper, cook and a helper. House boats are quite expensive in peak seasons. Better not to take anything for granted, so make sure the boat is clean and the facilities are working etc. If you want inland rides through smaller canals, a mid-sized boat such as a Shikara or a canoe could be the choice. Going through the real interior, along the tiniest canals, can only be done by canoes. Unless you desire to, there is no need to take a canoe. 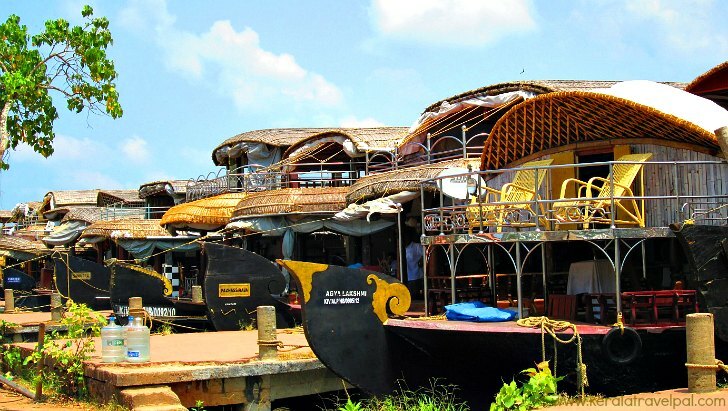 House boats are not just limited to the large Lake Vembanad. There are plenty of larger canals spacious enough to accommodate house boats. See the picture below. There are several attractions to Kuttanad. The winning factor is the scenery created by paddy fields, backwaters and leafy shores. Adding a few snaps of ethnic way of life for a more complete experience. A backwater tour is a non intrusive way of watching local life. People live around canals and use them for transport, washing, fishing, bathing......you name it. Do you know that Kuttanad is one of the lowest regions in India? The paddy fields are below the sea level. How much below the sea level varies from place to place. The higher region or Upper Kuttanad is slightly above the sea level. Areas coming under Lower Kuttanad are on an average, a couple of metres below the sea level. These paddy fields are even lower that the canals that flow by the side. Some of these paddy fields have been reclaimed from the lake during the last two centuries. So imagine how large the lake is. It is the longest lake in India. Four rivers - Pampa, Achencovil, Manimala and Meenachil – drain to it. Aimlessly drifting along is so relaxing, it is commonly included in Kuttanad backwater tours. Lake Vembanad, which spreads along large areas of several districts, meets the Arabian Sea south of Cochin. Dykes, dykes, dykes.....You are going to see plenty of them during Kuttanad backwater tours. They are for a good reason. Some dykes are so large that people have built houses on them. Coconut palms sway by the side of water all along these dykes, a pretty sight during Kuttanad backwater tours. 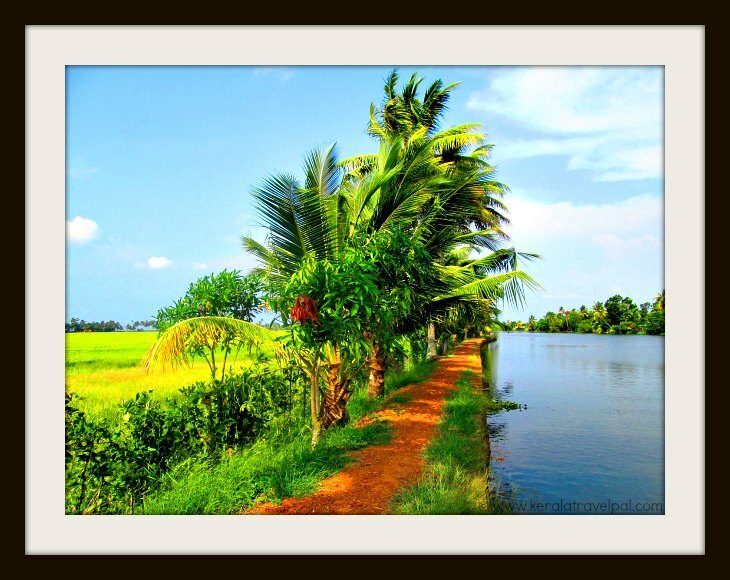 Do you know that Kuttanad is one of the very few places in the world where farming happens below the sea level? The other obvious place is Netherlands. The lowest place in India may sound as a fancy title. The downside for being so down is salinity. Salt water from the sea used to find way to the lower region during summer. This did not happen during the rainy season due to strong seaward water flow. There is a bund, a dam like structure built to prevent salt water from creeping in land. It is a place called Thanneermukkam, about mid way between Cochin and Alappuzha. Thanneermukkam bund has caused tremendous upswing to the productivity of paddy fields. Once the onslaught of salt water stopped, farmers were able to raise two crops instead of a single crop per year.For rice production, Kuttanad is the topper in Kerala. It may be inaccurate to say that Kuttanad has only paddy. Nowadays they have diversified into other crops such as banana, pepper and tapioca and more. Vacant paddy fields are used for fish farming, mostly with prawns. Duck farming is also popular. During Kuttanad backwater tours, it is usual to come across herds of swimming ducks, shepherded by men in boats. Sand mining, fishing, toddy tapping etc are also means of livelihood for people. Being a water land, you will see plenty of birds. If you are keen on sighting birds, take a boat ride to Pathiramanal Island. This tiny islet in the middle of Lake Vembanad is a bird haven. You can visit the island, if you like. Just by cruising along side, you will see many birds resting on weeds and sitting on wooden poles extending from water. Kuttanad is known for its boat races. There are many of them, and usually held during the festive period of Onam (August – September). If you are around during this period, it is worthwhile to watch one of them. Also, Kuttanad is a good place to try tapioca. Tapioca and fish curry is a common food for locals. Can you imagine once upon a time all this area was a forest taken down by a huge fire? Many villages end with the word kari which means burnt wood or charcoal - Kainakari, Ramankari, Chennamkari etc. A bit of digging revels burnt wood fragments. So it not just an ancient myth, far from it. Air port : Kochi Int’l Airport (COK)at 114 Kms from Thakazhi. Nearest towns : Alappuzha at 20 Kms from Thakazhi in Kuttanad. Kuttanad being a wide zone, some places are even closer to Alappuzha town. Accommodation Options : Hotels, lodges, homestays and resorts at Alappuzha. 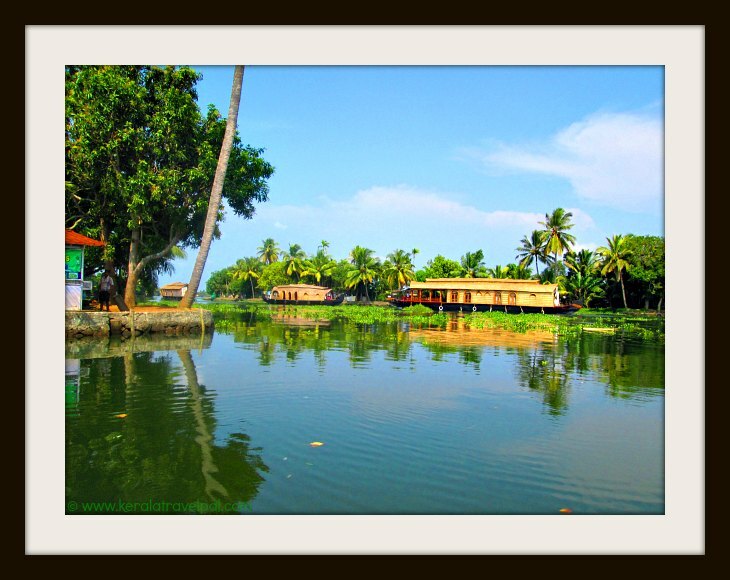 A few resorts and home stays at kuttanad. Best time to visit : Can be visited anytime during the year. Peak season between Nov – Feb. Nearby Attractions : Kumarakom bird sanctuary, Aruvikkuzhi waterfall, Alappuzha town (food & shopping), Alappuzha beach, Marari beach, Pathiramanal Island, Krishnapuram Palace, Karumadikuttan, Ambalapuzha temple, Arthunkal, Mullackal Temple, Chavara Bhavan and Edatuva Church.